The following is a summary of Estate Planning Law. It avoids, or may largely avoid, the probate procedure. It provides a mechanism for the management of an individual’s affairs in case the individual becomes Incapacitated. It often requires additional paperwork and accounting. It provides more privacy for one’s financial affairs at the time of death. It can have tax planning advantages for married couples. It is important to realize that the revocable trust leaves you in complete control of your assets until the occurrence of incapacity or death. You may choose to be the trustee of your own trust or to name someone else as trustee. In either case, you will have complete power to amend the terms of the trust, withdraw property from the trust, put additional property into the trust, or revoke the trust entirely, as long as these actions are done in accordance with the terms of the trust agreement. The terms of a trust usually require that such actions be carried out in writing, be signed by the creator of the trust and/or its trustee, and that records of such actions be kept with the trust agreement. The revocable trust does not, therefore, change the substance of your ownership rights. Probate is the court procedure that oversees the transfer of assets in a person’s estate after death. Probate is required if a person has a will (but not a revocable trust) or if a person dies intestate (without a will), or for certain assets not titled in the trust. A properly funded revocable trust avoids probate because the assets that are placed in it are subject to the terms of the trust, and must be distributed after death as the trust directs, not as your will directs. 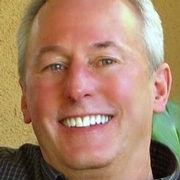 These fees are set by California law, and both the attorney and the executor may collect them. If the executor is a family member, he or she may elect not to take the executor’s fees. In that case, the comparison of costs between a trust and a will should not consider the fees of the successor trustee or executor. Since there are likely to be some attorneys’ fees in connection with the administration of the revocable trust upon death, not all of the fees can be saved with the use of a revocable trust. However, one may expect that a substantial portion of the attorneys’ fees will be avoided, particularly in the larger estates. Even in the smaller estates, titling your assets in a trust may save an estate thousands of dollars. The probate process in California has certain deadlines and timeframes to administer an estate, including a mandatory four-month window in which creditors may file claims. A typical probate takes a year or longer, depending on the backlog of the court. Since trust administration does not typically require court oversight, it can be completed faster than the probate process. If a person owns real estate in several states, it may be especially advantageous to establish a revocable trust. Otherwise, separate probate procedures may be required in each state where real estate is located. Probate may have advantages in certain situations. The probate procedure provides court supervision, and may therefore provide greater assurance that property will reach the beneficiaries for whom it is intended. Furthermore, probate generally cuts off creditor’s claims more quickly, since such claims must be made within four months after publication of the notice to creditors. If the decedent has large potential debts or lawsuits, it may be important to utilize a probate procedure to cut off any claims. In the trust instrument, the settlor (creator) of the revocable trust nominates a successor trustee, who will become the trustee if the initial trustee becomes incapacitated. Therefore, if you are the trustee of your own trust and become incapacitated, the trust provides an automatic mechanism for the individual named as successor trustee to step in and take over the management of your financial affairs, at least as to those assets which are titled in the revocable trust. In this way, the trust may avoid the necessity of a conservatorship over your affairs on your incapacity. For the revocable trust to be effective, your assets must be transferred into it. The owner of your stocks, real property, and bank accounts will appear as, for example, "John Smith, Trustee of the Smith Revocable Trust, dated January 7, 2015." When you first establish your trust, you should change the title to your property, and then you must be careful to maintain all of your significant assets in the proper trust titled form. If your assets are not held by your revocable trust at your death, a "pour-over" will puts the assets into the trust, but that step could require a court procedure. It is preferable for you to continually maintain your trust by holding title to your assets in the name of the trust. At your death, your will must be "lodged" or filed in the in the county of your residence, even if there will not be any probate. If your will disposes of your assets, your bequests will be public record. Additionally, if your will is probated, your executor will have to prepare an inventory of your assets for the Court. This inventory will be open to the public for inspection. If you have a revocable trust, and the title of assets is in the trust, your assets and bequests will be private. No outsider will be entitled to know the contents of your estate, or the identities of the beneficiaries. Since the trust remains private, if your trust is properly funded, your bequests normally will not be open to public inspection. Your beneficiaries and other heirs, however, would likely be entitled to view the trust and its terms. For most people, it is preferable to execute a trust rather than simply a will. Although preparing a revocable trust may be more expensive than preparing a will upfront, the long-term costs to a person’s family will be substantially smaller with a trust. The additional advantages of shortened time of administration and increased privacy greatly outweigh any inconvenience with transferring the title of your property into the trust. The type of the trust and the manner of transferring your property to your loved ones upon your death will be discussed in the next part of this memorandum. In addition to the advantages of privacy and probate-avoidance, there are often estate tax advantages to implementing a trust. The estate tax has been a part of the federal tax structure (off and on) for over one hundred years. The rest of this discussion will be based on rules that are currently in the Internal Revenue Code and are effective as of January 1, 2018. The unified credit allows each individual to transfer a certain amount of assets (including gifts made during lifetime and transfers at death) exempt from "transfer tax". It does not matter to whom the assets are transferred or what type of assets are transferred. The lifetime exemption amount for both gift and estate purposes is $5,600,000, effective January l, 2018. Gifts made by an individual during his/her lifetime (other than those described in 2 and 3 below) are combined with the individual’s estate at death to determine whether the $5,600,000 limit has been exceeded. The tax rate on gifts or the estate above the exemption amount is 40%. The marital deduction allows a person to transfer an unlimited amount of assets to his or her spouse, without tax. Consequently, it is easy to avoid tax completely when a husband or wife dies, if everything is left to the surviving spouse. However, the marital deduction is not available if the surviving spouse is not a United States citizen. In that case, special planning must be done in order to avoid or minimize the estate tax due on the death of the first spouse. One of the permutations of the AlBIC Trust (discussed below) involves the situation of a non-citizen spouse. In addition to the lifetime gift exemption amount, annual gifts of up to $15,000 per year can be given to an unlimited number of persons free of gift tax. Those gifts will not use up any part of the giver’s lifetime exemption amount, currently $5,600,000. Additionally, gifts made directly to an educational institution or health care provider (including an insurance company) on behalf of another do not count against the $15,000 annual exclusion or against the lifetime exemption amount. Transfers to charity (by gift during life or by transfer at death) generally are not taxed. Gifts to trusts that benefit both charity and individuals may qualify for reduced taxes. Married couples with substantial community property have three basic options for planning their estates. If one or both of the spouses own substantial separate property, they should speak with their attorney to discuss other factors and alternatives. Selection of one of the three options requires a thorough review of family goals, an analysis of the family’s wealth, and a balancing of tax savings and management continuity. It should be kept in mind that all community property, including the proceeds of community property life insurance policies, is treated as belonging one-half to each spouse. Consequently, the taxable estate of first spouse to die includes only one-half of all such property. In all three of these options, the entire trust is revocable until the death of the first spouse to die. At that time, one or more of the sub-trusts may become irrevocable, but at least part of the trust will be revocable and amendable by the survivor. 1. ’’All to the Survivor’s Trust"
Under this option all property of the first spouse to die (the "Deceased Spouse") is funded to the Survivor’s Trust, which remains fully revocable by the survivor. Provided the Surviving Spouse is a U.S. Citizen, no estate tax is due on the death of the Deceased Spouse because of the unlimited marital deduction. However, the entire estate is then subject to estate tax upon the death of the Surviving Spouse, using the value of assets at that date. This plan could result in a higher overall estate tax burden on the family after both spouses are deceased. Congress has passed new laws that may reduce the estate tax burden. If the Surviving Spouse timely files an estate tax return with the Internal Revenue Service upon the Deceased Spouse’s death, the Surviving Spouse would be eligible for "portability." This election would give the survivor the ability to use his or her own estate tax exemption, plus the Deceased Spouse’s unused exemption (subject to certain restrictions and conditions). 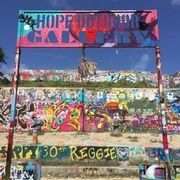 "Portability" may only be elected by filing an estate tax return, Form 706, with the Internal Revenue Service, and claiming the amount eligible for "portability" on that return. The Surviving Spouse’s exemption, under this scenario, would be as high as $11,200,000.00 in 2018.
lf "portability" is not elected by the survivor, the Deceased Spouse could have transferred up to $5,600,000 of his or her estate to anyone without any estate tax due. If the Deceased Spouse gives all of his or her property to the Surviving Spouse, then the Deceased Spouse’s estate qualifies for the unlimited marital deduction, so there is no taxable estate at the time. If the exemption amount is not claimed on the death of the Deceased Spouse and "portability" is not elected, then the Deceased Spouse’s exemption is lost. 2. "The AlB Trust" or "The A/Marital Trust"
In simplified terms, under this option, upon the death of the Deceased Spouse an amount equal to the Deceased Spouse’s exemption amount is left to the "Bypass Trust," and the remaining property is given outright to the Surviving Spouse. Generally, the Bypass Trust distributes its income to the Surviving Spouse, and gives the Surviving Spouse a limited right to invade principal for health, education, support, or maintenance. Often, the Surviving Spouse has a limited power to direct the remainder interest (what’s left after the death of the Surviving Spouse) among the couple’s descendants, and/or charity. Using a traditional AlB Trust, no estate tax is due on the death of either the Deceased Spouse or the Surviving Spouse for the property allocated to the Bypass Trust. Therefore, all appreciation in the asset values in the Bypass Trust escape estate tax in the Surviving Spouse’s estate. 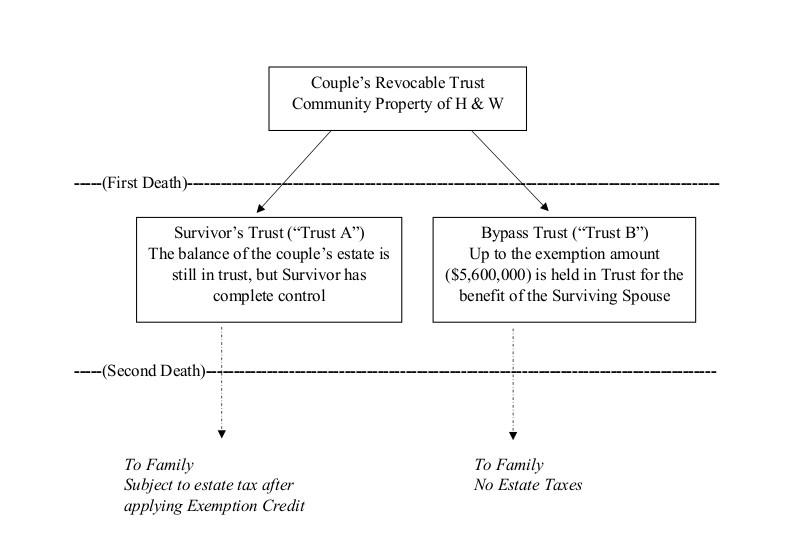 Assets left outright to the Surviving Spouse (or to the "Survivor’s Trust") will be subject to estate tax on the death of the Surviving Spouse, but the Surviving Spouse’s exemption amount will still be available to the Surviving Spouse’s estate at his or her death, as illustrated below. Due to recent changes to the estate tax laws, the Surviving Spouse could elect to include the assets of the Bypass Trust in his or her estate, and thereafter elect "portability." The advantage would be to give the Surviving Spouse’s estate a step up in basis for assets in the Bypass Trust at the survivor’s death. However, there are also risks for this strategy. If the assets of the Bypass Trust and/or Survivor’s Trust increase in value over the exemption, increased estate taxes may be due. In addition, future changes to laws could affect this benefit, such as Congress lowering the exemption from estate taxes. 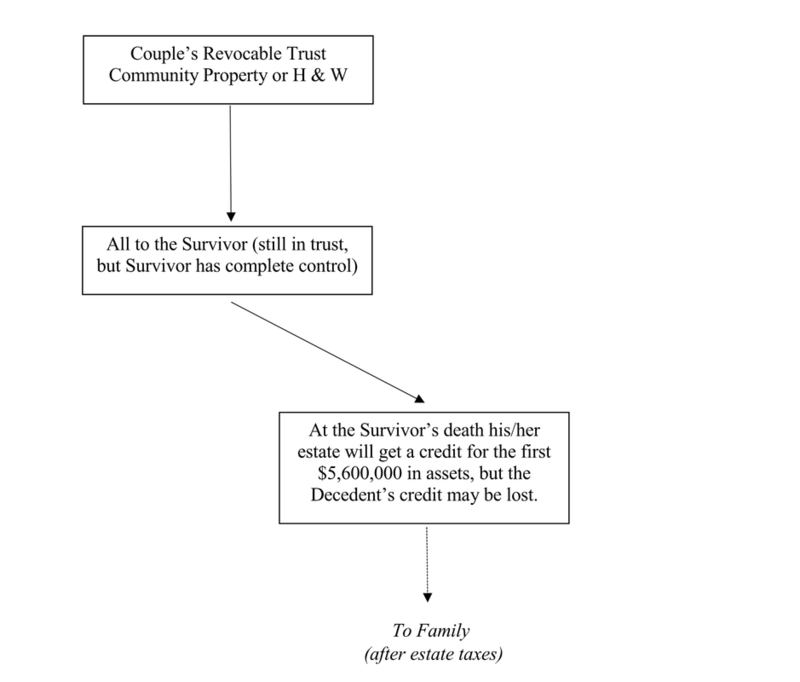 The A/B Trust does not give the Surviving Spouse complete control over the assets that once belonged to the Deceased Spouse and are put into the Bypass Trust, to the extent possible under the "All to the Survivor’s Trust" option. 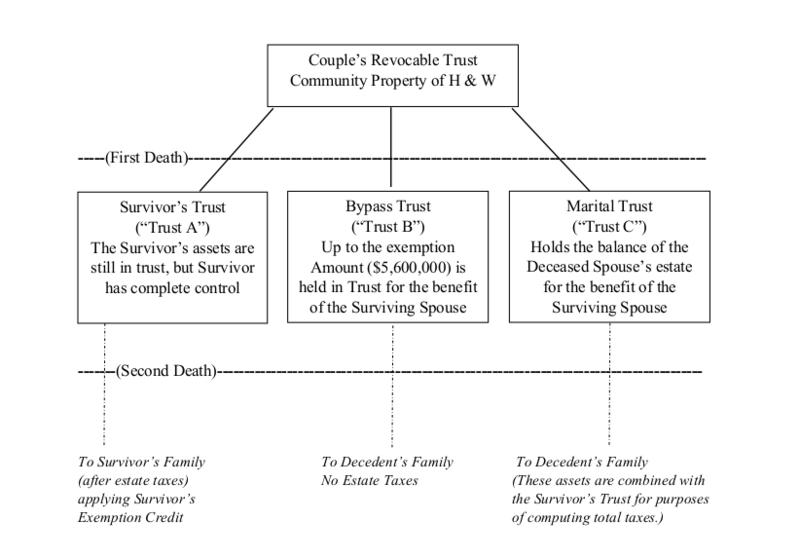 Although the Surviving Spouse (as the Trustee of the Trust) may have the discretion to choose investments and the power to make some changes to the remainder beneficiaries, the Surviving Spouse will still have fiduciary duties and be required to account for his or her actions over the Bypass Trust. If the couple is concerned about this control and is not sure that they will be impacted by the estate tax, the couple may want to leave the decision of whether to use the first or second option to the Surviving Spouse. This trust with dual provisions is known as a "Disclaimer Power of Appointment Trust". The Surviving Spouse can disclaim all or any portion of the Deceased Spouse’s assets, but generally only disclaims the amount that would be protected by the exemption amount. A qualified disclaimer by the Surviving Spouse must be made within nine (9) months of the death of the Deceased Spouse, in order to achieve the full advantages of the A/B Trust. 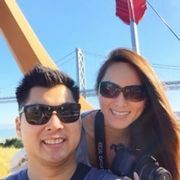 Regardless of whether the couple selects the A/B Trust or the disclaimer alternative, the Surviving Spouse may choose to make a disclaimer of more than the exemption amount in order to pay estate taxes at the death of the Deceased Spouse, rather than wait until the death of the Surviving Spouse. Your attorney may advise the Surviving Spouse to consider making such a disclaimer if your property is rapidly appreciating, and would be taxed at a much higher value upon the death of the Surviving Spouse. If the Surviving Spouse elects to disclaim a portion of the Deceased Spouse’s property, the Surviving Spouse may not control the remainder beneficiary of that portion. If the Deceased Spouse’s estate is less than the exemption amount, so that the Bypass Trust is funded with less than $5,600,000, the Surviving Spouse may elect "portability" over any portion of the Deceased Spouse’s exemption that is unused at the Deceased Spouse’s death. Under this option, at the death of the Deceased Spouse, three trusts may result. As with the AlB Trust, the Bypass Trust consists of the available exemption amount. Since the Bypass Trust consists of the Deceased Spouse’s available credit, no estate tax will have to be paid on this amount (either on the death of the Deceased or Surviving Spouse). As discussed in the section above, it may be possible to make an election ("QTIP Election") and thereafter elect "portability" for assets in the Bypass Trust. The balance of the Deceased Spouse’s property, over and above the exemption amount, is allocated to the "Marital Trust" (technically known as the "qualified terminable interest property" trust ("QTIP" Trust)). If the Surviving Spouse makes an election for this trust, the Marital Trust will qualify for the marital deduction so that estate taxes on this property will be deferred until the death of the Surviving Spouse. If the Surviving Spouse is not a U.S. Citizen, there are additional requirements to avoid the estate tax at the death of the Deceased Spouse, which you should discuss with your attorney. The trust for the benefit of a non-citizen spouse is known as a qualified domestic trust ("QDOT"). The AlBIC Trust does not provide for more estate tax savings than the A/B Trust. Its primary advantage is that it gives the Deceased Spouse control over the ultimate recipients of his or her share of the total estate, rather than just control over the amount in the Bypass Trust or no control if all assets are left outright to the Surviving Spouse. Once the appropriate form of trust is selected, the settlor(s) must decide whether the ultimate beneficiaries will receive their inheritance outright or in trust. A trust may be beneficial if a beneficiary is too young or immature to handle the funds. A responsible trustee will manage the trust until the beneficiary reaches a certain age or milestone (e.g., graduation from college). A trust may also be appropriate if the Settlors want the funds to benefit many generations in succession or to benefit a group of people (e.g. grandchildren) so that they all have the same financial opportunities (e.g. college tuition). A trust may also protect the assets from the beneficiary’s creditors or from loss on the dissolution of the beneficiary’s marriage. For many couples, one of the three options discussed above will be fully responsive to the family’s needs and goals. However, these options certainly are not the only estate planning alternatives available to a family. For example, for families where there is substantial life insurance, the irrevocable life insurance trust provides cash for payment of the estate tax liability which is usually due upon the death of the Surviving Spouse, without a potential 40% reduction of the value of the life insurance due to estate tax on the insurance. In addition, charitable gift planning can be combined with family distributions and protection. In some cases, the charitable gifts may result in elimination of most estate tax while still passing assets to family after a time delay. Further, income tax issues must be dealt with in the structuring of the overall estate plan. It is very important to speak to your attorney about your specific family goals. Durable Power of Attorney is a written document which one person (the principal) signs to empower another person (the attorney-in-fact) to act on behalf of the principal. This document is very useful if the principal is often away or would like assistance in the management of his or her financial affairs. 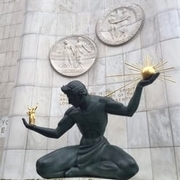 If the principal does not want the attorney-in-fact to have the power while the principal is able to act, the Durable Power of Attorney can provide that the agent’s power "springs" into action upon the incapacity of the principal (called a "Springing Durable Power of Attorney"). If not every asset is held in the trust when the principal becomes incapacitated, the attorney-in-fact can transfer the assets into the trust. Like the Durable Power of Attorney, an Advance Health Care Directive is used so that one person can make decisions for another. Pursuant to this document, the agent may make medical decisions for the principal if the principal is unable to communicate his or her health care wishes. The agent can make all decisions about the health care of the principal, subject only to limitations specified in the document by the principal and some other restrictions by law. For example, an Advance Health Care Directive does not give the agent the power to commit the principal to a mental health facility or to authorize sterilization. It may give the agent some post-death powers including the power to donate the principal’s body parts for transplant and to direct the disposition of remains. In this document, the principal may also state whether he or she would like to be kept on life support if suffering from a terminal condition. If the principal states his or her preference, the agent is bound to follow his or her wishes. The Advance Health Care Directive is effective for an indefinite time unless its duration is limited or it is revoked. A HIPAA Release can allow family or other named persons to access confidential medical information which could be important in a medical emergency or loss of mental capacity.